The first step is to learn your unique BrainStyle®. Visit our store and order The BrainStyle® Inventory© today. Find out how to apply your BrainStyle® gifts with your boss, your team or your family. Visit our online store to purchase the book. Once you determine your BrainStyle®, one of our certified coaches can help you strategize how to maximize your potential. "Each of us has a natural brainstyle wired from our genes. Your brainstyle is a core set of gifts, the essence of what you have to give. You may have taken any number of personality tests, such as the Myers-Briggs Type Indicator, but have they taught you how to leverage and apply your hardwiring? Do you know how to take advantage of differences? The BrainStyles Systerm® offers leaders, managers, HR professionals and Executive Coaches tools for working one on one, making clear organizational assessments, and building teams with proven strategies that are simple to use in stress situations. "I invite you to explore our web site. Learn how BrainStyles was born in a business setting instead of a classroom. Explore how you can get behind behaviors and appearances to the gifts beneath. No more tricks or communication techniques, just you being you at your best, using your natural brainstyle." 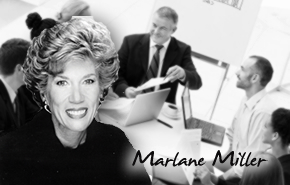 Marlane Miller, Author, Developer and Researcher of The BrainStyles System®, Founder of the international Licensing organization, BrainStyles, Inc.